This item was made in three pieces see final photo. He brushed off the dust, covered the lathe bed and gave the item two coats of cellulose sanding sealer which was diluted 50/50 with cellulose thinners, applying it with a rag. He followed this with Briwax applied with 0000 wire wool and buffed it to a shine with a soft cloth. 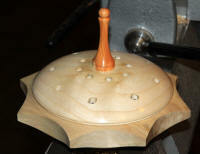 The yew finial blank was mounted in O’Donnell jaws (photo AT11_16) and the tailstock brought up for support to begin with. 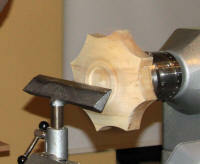 The item was roughed to a cylinder, planed with the skew, shaped, sanded, sealed and polished with carnauba was. It was parted with the long end of the skew, and glued in to the lid. (photo AT11_17). See finished item (photo AT11_21). Alan kindly left a “kit” for the project for our raffle.